Jonathan’s wife had lost a small Diamond in her engagement ring, so instead of just repairing it, he took the opportunity to refresh the whole ring. He wanted to change the ring into a beautiful long lasting design, while keeping the squarish feel of the original. We added more corners to the surrounding ‘halo’ to give it edges while keeping the clean look of the Diamond-set band. Old engagement ring on the left. The square halo was turned into a more delicate looking Octagon. Beautiful even from the back. 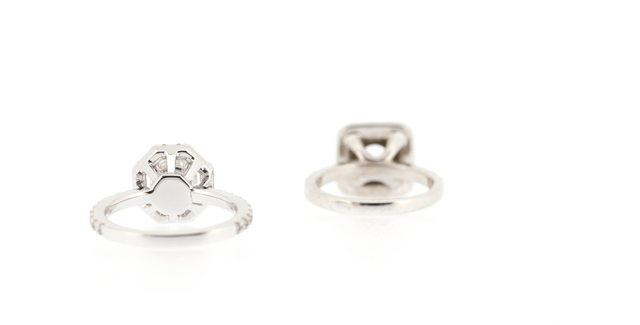 The new ring (left) has a more refined support at the back of the centrepiece. A refreshed version of the old engagement ring. Old casing in background.